Wha’d You Bring Him In Here For? Rubin “Hurricane” Carter, the former boxing champion whose conviction for a triple murder was overturned after he served nearly 20 years in prison, has died of prostate cancer. Carter, whose story inspired a Bob Dylan song and a Denzel Washington film, was 76. Too soon gone; too much life stolen. He was active in the movement to free wrongfully convicted prisoners, reports Jon Kalish for our Newscast unit. Those who talk of post-racial America forget too easily, I think, how ferociously state violence was employed to enforce racial hierarchy here. For a different story that conveys this, check out Devil in the Grove, and consider how long the sheriff at the heart of the judicial murders documented there held on to terrifying local power. It’s a little less explicit now — but those days aren’t all gone yet, not by a long shot. That’s why, in part, Carter’s post prison cause could keep him so fully occupied. But for now, let us remember Rubin Carter himself. A 20th century American life. 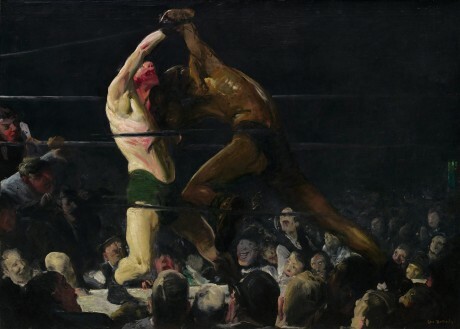 Image: George Bellows, Both Members of This Club, 1909.